An Open Indictment Of Michael Chabon & Ayelet Waldman, Self-Haters: How DARE They Malign Jews Who Support Trump & Israel! AKIN to the punctuality of a Swiss clock, the decades-old cottage industry of “Palestinian/Leftist Resistance” never pauses to take a break. In fact, it is accelerating at breakneck-speed. Yes, the oft-mentioned red/green alliance. INDEED, much has been revealed at this site attesting to the same. Nevertheless, on the freedom-based end of the spectrum, the truths within catapult across the internet with countless re-blogs – thus, acting as a substantial counter-weight to historical fabricators. Thank G-d. MOST recently, via “Follow The Jihadi Money Into Camp Solomon Schechter’s Palestinian Flag Raising: Interfaith Smokescreens”, The Palestinian Trojan Horse and Jewish Institutions exposed that which leftist-fascist Jews (as water carriers for Allah’s Muslim Terrorists) are loath to admit, that is, they have an inextricable nexus, a collusion, with stone-cold Jew-killers – albeit couched under every anti-Zionist’s favorite trope, “occupation.” Immeasurably, one cannot claim to be “the good/real” Jew, or recoil when being called an anti-semite – self-hating or otherwise – if one denies the Jewish people title to their thousands-year-old Jewish homeland! Credo quia absurdum. WHICH brings this discussion straight to the doorstep of two such “Jews of interest”: introducing, Michael Chabon and Ayelet Waldman! NOW, some readers may query: who the hell are they? ipso facto, why do they even matter? Well, as to the first inquiry, click on. Keep reading too. As to the follow-on question, the answer is very complex and has a dynamic all of its own. ALAS, it is precisely to the goings-on of this attention-getting and smug literary duo (who happen to be the middle-aged darlings of the leftist-fascist “resistance” in America and Israel) that all of us – Jews and non-Jews alike, who refuse to cow and bow to the red-green alliance – must counter and RESIST against. This is the case, if our end goal is to preserve western freedoms, particularly, freedom of speech. IN no uncertain terms, freedom of speech – a core underpinning to every other freedom – is in the fascist-left’s cross-hairs. In tandem, their laser-sights are targeted toward self censorship ala shaming, assigning blame, gaming and all manner of propaganda techniques, as well as pressuring the legislature re this and that labeling vis-à-vis so-called “hate speech” and the like. PARADOXICALLY, as it happens, the aforementioned omertàs are key and core to fascism and Nazism, and they are derivatives of the left! Mind you, Chabon and Waldman (leftist-fascists to the tee) would have the rest of us, aka “knuckle-draggers”, believe that such a claim is a vast right-wing conspiracy! This is precisely why they keep turning the historical truth upside its head; tarring and feathering all those who disagree with their dictates. Effectively, we must all sit down and submit to them – or else. 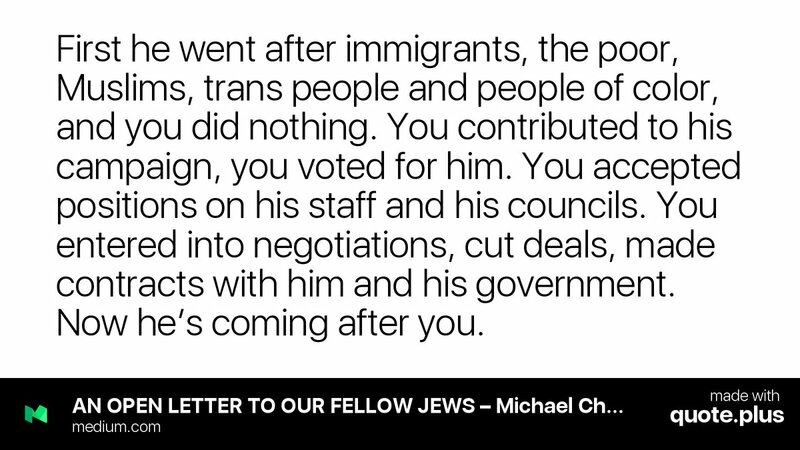 Authors Michael Chabon and Ayelet Waldman have penned an open letter to fellow Jews, warning them that if they do not oppose President Donald Trump, they will be labeled as Nazi collaborators and traitors to their people. Chabon and Waldman, who were earnest supporters of President Barack Obama, and said nothing when he abandoned Israel and elevated the antisemitic Iranian regime, published their letter on Medium on Thursday. Using classic antisemitic tropes, they address Jews who may support Trump because of “private business deals” or other personal interests — “You entered into negotiations, cut deals, made contracts with him and his government” — and urge them to turn against him. Chabon and Waldman also resort to blatant lies: “You have counted carefully as each appointment to his administration of an avowed white supremacist, anti-Semite, neo-Nazi or crypto-fascist appeared to be counterbalanced by the appointment of a fellow Jew,” they say, providing no proof whatsoever that Trump has appointed anyone that matches any of those descriptions. They single out White House adviser Steve Bannon as a “white supremacist godfather,” a complete slander that has no basis in reality. They claim that President Trump “expressed admiration and sympathy for a group of white supremacist demonstrators who marched through the streets of Charlottesville,” when in fact he condemned “this egregious display of hatred, bigotry, and violence” on Saturday, and explicitly condemned white supremacists on Monday and Tuesday. Chabon and Waldman, who presumably understand the importance of words, seem to misconstrue Trump’s defense Tuesday of legitimate protesters — whose presence was confirmed by the New York Times, no less — as a defense of the extremists he repeatedly denounced. They also claim, falsely and illogically, that if extremist groups say they support Trump, that means he supports them in return, despite his repeated disavowals. “Sitting shiva” refers to the ritual of mourning, meaning that Chabon and Waldman are urging Ivanka Trump to threaten to declare her father dead to her as a way of intimidating him. Any Jew, anywhere, who does not act to oppose President Donald Trump and his administration acts in favor of anti-Semitism; any Jew who does not condemn the President, directly and by name, for his racism, white supremacism, intolerance and Jew hatred, condones all of those things. Chabon and Waldman’s letter, which can be read here in full, is being circulated by liberal Jews to their relatives and friends in an effort to pressure them into opposing Trump. MORE indicting, some of us understood what went down in Charlottesville, Virginia and it was hardly unexpected. In fact, it was pre-ordained – stoked by George Soros funded shock troops via Obama Inc.’s Shadow Government! BUT not to be lost in the discussion, the fact that authentic white supremacists were part of the mayhem in no way obviates two intrinsic factors: without a doubt, a goodly majority of those who marched to protect free speech were ordinary Americans – no more Nazi-like than the average Joe and Jane who voted for Trump, in the expectation of “making America great again”! And, therein lies their “original sin”, at least, according to Chabon and Waldman (and fellow anarchist travelers), whose ultimate aim is to bring down America. In real terms, the duo are socialists – one of several points within the continuum of leftism-fascism. At Charlottesville, the former Ku Klux Klan leader David Duke ranted in deranged fashion about alleged Jewish power over the media and banking system and about the ”Zionist ethno-state of Israel”. But this vile outpouring is indistinguishable from the antisemitic tropes spewed out by “antifa” groups, of the kind that clashed at Charlottesville, and beyond them the left in general and beyond then too; indeed the trope of Jewish power controlling the world was institutionalised by Mearsheimer and Walt in their book The Israel Lobby, and yet they remain esteemed and even lionised in academia. GLARINGLY so, this “literary duo” hail Antifa thugs and assorted anarchist gangs as American heroes, as they riot across the nation like atypical leftist-fascist storm troopers did throughout history. In a nutshell, leftist violence has gone mainstream. 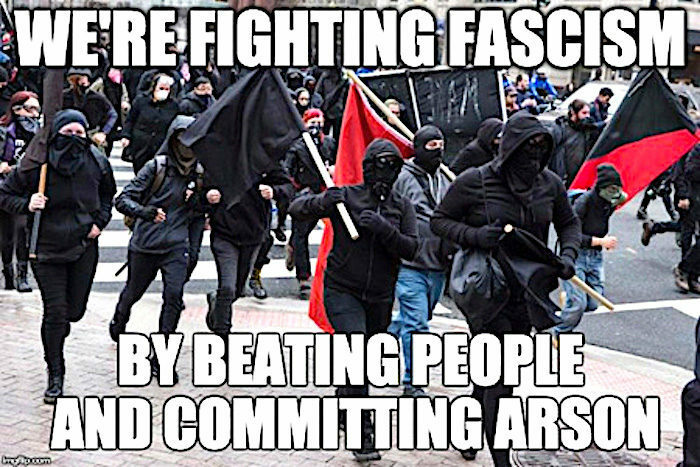 Antifa and other leftists actually have been regularly attacking mainstream Republicans ever since President Trump became a candidate. Simply put, the difference is that there were never any right-wing mobs attacking Hillary Clinton supporters, while attacks on Trump supporters by leftists became a familiar sight during the 2016 presidential campaign. And long after. And, while there is no evidence of a growing right-wing extremist movement, even left-leaning journalists have found abundant evidence of a rapidly growing violent left-wing movement, as well as signs of it going mainstream, along with an increasing normalization of political violence. The left held 47 protests, many violent, against Trump from the day he announced his candidacy for president on June 16, 2015, until his election on Nov. 9, 2016. EVEN so, for a more robust “who’s on first” via the Truth Meter, readers should listen up and imbibe said facts. Pointedly, this Brotherhood/Islamic jihad expert’s(middle) finger is directed at Chabon and Waldman – smarties that they think they are, they are the ones who desperately require this video-based teaching tool. Btw, it is free of charge. Mind you, no thanks is necessary nor anticipated. TO wit, those of us who place a premium on intellectual integrity, also tend to recognize what’s what and who’s who. It is this internal barometer which scares the daylights out of the likes of Michael Chabon, Ayelet Waldman, and a cadre of fellow travelers – leftist-fascists who hide under the veneer of liberal values. Not nice. Not nice at all. AS we say in Israel – איזה חוּצפָּה ! !